Beautiful 18th century map of Spain and Portugal. A New Map of Spain and Portugal. Showing their Principal Divisions, Chief Cities, Townes, Ports, Rivers, Mountains, etc. 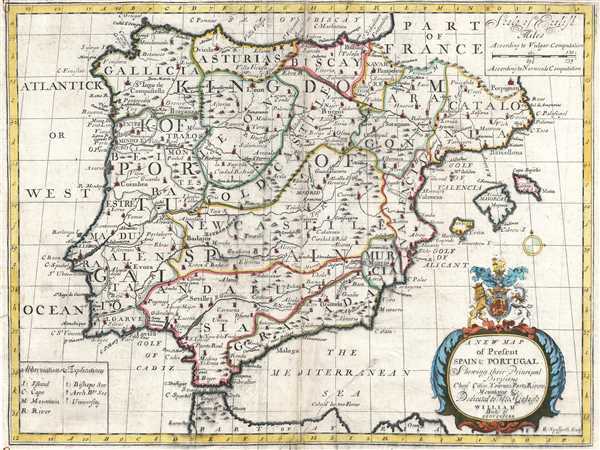 This is a 1700 Edward Wells map of Spain and Portugal. The map depicts the Iberian Peninsula, where both Spain and Portugal and located, from the Bay of Biscay on the top to Morocco on the bottom and from the Atlantic Ocean on the left to the Mediterranean Sea on the right, as well as part of southern France. The map divides both Portugal and Spain into regions, including Granada, Murcia, Valencia, Catalonia, Aragon, Navarre, and Galicia in Spain, and Algarve and Estremadura in Portugal. Cities abound in both countries, including Lisbon and Coimbra in Portugal and Madrid, Barcelona (Barcellona), Bilbao, Murcia, Valencia, and Seville in Spain. Perpignan, France is depicted as well. The map also depicts Majorca, Minorca, and Ivica in the Mediterranean. This map was produced by Edward Wells and engraved by Robert Spofforth. It was included in Wells' A New Sett of Maps both of Ancient and Present Geography, published in London in 1712. Robert Spofforth (fl. 1700 - 1707) was an English engraver and printseller known primarily for his frontispieces. He contributed nine engravings to Edward Wells’ A New Sett of Maps both of Ancient and Present Geography, including the frontispiece of the atlas. He was thought to have been a student of the engraver Simon Gribelin. He was also known for his portraits, namely those of Queen Anne and Prince George. Good. Some soiling, wear, and centerfold damage. Narrow margins as issued. Backed on archival tissue.